As is written in a poem,” What matters most for a mountain is not its height, but its heavenly inspiration .” The soul of a mountain lies in its ” heavenly inspiration “, and there is a little-known ancient mountain in Shaanxi, Erlang Mountain in Shenmu county. The steep can be compared with Mountain Hua, while the beautiful scenery can be compared with Emei Mountain. A hundred temples are sited in one mountain, and the temple has witnessed its development. Erlang Mountain is commonly known as Xi Mountain. It is located at 1 km west of Shenmu City with meandering mountain roads. The Kuye River and the Tuwei River will flow in front of the mountain, meanwhile, the majestic Great Wall goes through in the back. In the west, there is a fruit forest with sand and stone soil inside. The stone wall in the east is steep and pine trees are tall. The mountain could arise your unlimited imagination. In the thirteenth year of Zhengde in the Ming Dynasty (1518), when Emperor Wu Zong was patrolling this mountain, he thinks that it looks like a pen holder（bijia in Chinese）,hence the name “Bijia Mountain”. Later, the scholars came here, someone among them regards it as a hump（tuofeng in Chinese）,therefore, it is called: “Tuofeng Mountain”. 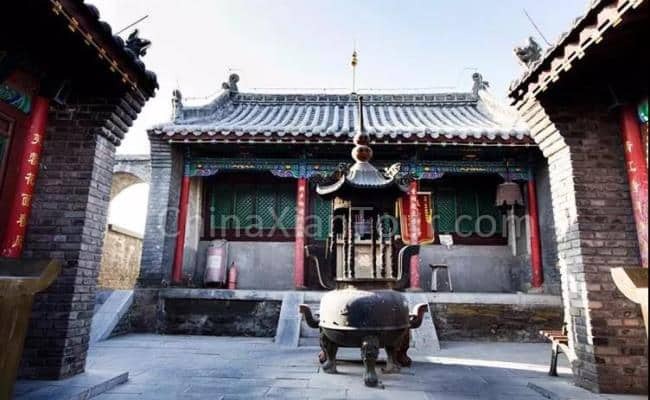 The most spectacular temple communities are located here，no matter you are Buddhist, Taoist or Confucian, you can find your belief at here. For many centuries, the people lived here regard the mountain as a god in the mind. Thousands of people’s wishes are hided in this mountain, which has given people the spiritual support of life. It is said that many temples are gathered here, therefore, the heavenly inspiration here are the most popular one. Anyone who has been to the temple will be able to do everything smoothly. The temples are ancient and simple, so, few visitors come to here. Every year, two grand temple fairs will held at the temple. On that day, people will get up early, and bring their best wishes and then swarm into the mountain from all directions. They will prostrate themselves with sincerity around the incense smoke, with the chime bell rings and good attendance. This is the ritual that belongs to this land. The temple group was built in the 8th year of zhengtong during Ming Dyansty (1443), which has the history of nearly 600 years. Here, you can experience the trace of time. The mottled wall, the old threshold, the incomplete murals and the bells in the mountain are the testimony of history. Everything here is a valuable art collection. Everything is meaningful in its taste. 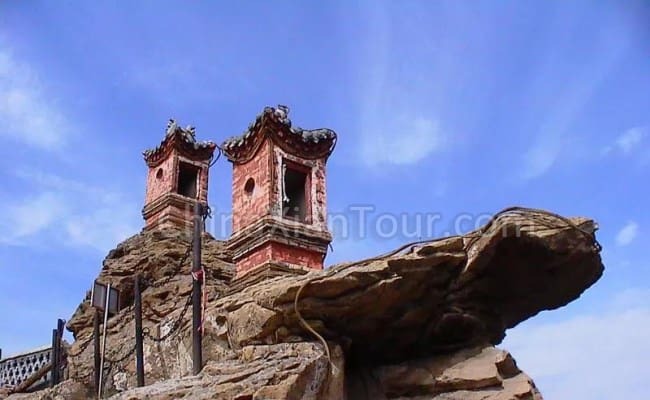 More than a hundred temples are standing on the top of the cliff, or hidden in the stone cave. And after nearly 600 years,it still standing upright, what an amazing ancient craftsmanship and wisdom. The facade of the gateway is beautifully painted, and the murals in the temple are mainly composed of heavy oil paintings. Old and fascinating, but the true of religion are all vividly explained. Besides, colorful stone inscriptions are the best evidence to restore history. In addition to the rich culture, there are also amazing views here. It is called ” Small Mountain Hua in the north of Shaanxi area”. The mountain is not high, but is extremely precipitous. Walking from the foot of the mountain, and towards the mountain gate, the pavement is gradually narrower and the mountain is more and more dangerous. People almost need to climb in a vertical direction, and grab the guardrail to arrive the top. Looking across the mountain, Erlang Mountain looks like an axe, because the cliff is broken, and the stone likes a forest. Several caves are among the mountain , and ancient temples look like stars. The foot of the mountain are surrounded by clear water, which has added a little spirit to here. Here, you can see the old trees growing from the walls. After a hundred years, it is still lush, as if the god has protected the serenity of the temple. The crisp bells echoed in the morning, usually, birds fall on the temple with eyes closed and calm, as well as the green color that came out of the wall, quiet and beautiful. 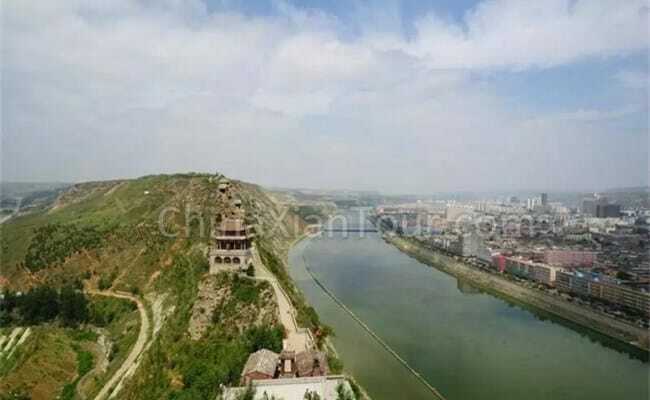 If you climb up to the top of the mountain, you can enjoy a panoramic view of Shenmu County. The Kuye River is in the middle, on the one side is a small town with a misty atmosphere, on the other side is a quiet and quaint temple community. It is one place has two kinds of lifestyle. During the sunset in every summer and autumn, the Kuye river surrounds the mountain in the mist. At night, Erlang Mountain is more romantic and more beautiful. The neon light painted beautiful curves. The sparkling lights look like the sea of stars. When the breeze blowing, the river flows, at the moment, it is as beautiful as a fairyland. In the busy work, be sure to find a time, and come to the small town to find this pure land in the mountain, then, you could let everything start afresh and enjoy a short flight. In a word, Erlang Mountain is a good option for a Xian Side Tour.